1. What’s the impact on search? If the leading brands go app-only (not only mobile web; Myntra doesn’t let you see their mobile web version too… forces you to download app and Flipkart is heading there too!). For example, if a user is going to use Siri, or its Android and Windows equivalents, I’m assuming they return results from respective search engines, right? If leading e-commerce stores hide behind their app gates, where does that leave them with search results? Or, is search not important for them at all and they want people to (!) only come to app with or without an intent and look up? That would be like me entering a mall (with multiple stores) with nothing specific in mind and start to window shop and end up buying something. 2. Earlier, these brands prioritized on one mobile OS ecosystem over the other based on numbers. So, they had an Android-first strategy given sheer number of Android users in India. Then, looking at the value created per user in iOS, they added that too. With so much funds they have raised over time, you mean to say they are not willing to have even a small team manage web version or mobile web verison of their websites and instead getting the entire team to focus only on the app version? I get it – some numbers being thrown around say that 90% traffic is from mobile. But is all that 90% via apps? Or does it include mobile web? Even if mobile web was say, 10% traffic, 10% of the mega million user base of these brands would still mean something… enough to have a team focus on it, right? Why go the Henry Ford way by forcing people… to shop only one way? The number of times I have searched on Google for something, seen a Myntra link, clicked on it, only to be forced to download Myntra app is massive. In all those times, I have avoided downloading the app, used web version of the app in my mobile or Mac to continue shopping. That’s just me, though – a strictly anecdotal example. The sheer benefit of things going online is choice. Offline comes with its riders and constraints – in terms of space and cost. Online is seemingly endless. If online is going to force users to do things the shop’s way (“You can shop only from that store of ours; other stores won’t have stock”), aren’t we going back to replicating the offline constraints-loaded model online too. 3. What if tomorrow (or eventually) Android Play Store or Apple App Store rules are ‘evolved’ by their respective owners to include a higher/heftier cut from certain types of apps that go through more financial transactions than others? For example, I may transact only once or twice via a New York Times app, but may transact 10+ times a month via a Flipkart app. What if the mobile OS parents see this an opportunity to ‘tweak’ the rules a bit and seek higher charges per transaction from e-commerce apps? Does that sound silly, or preposterous? Why? If the land owner of a piece of land on which a leased store exists can sense a bigger payout seeing the success of the store, can’t the same happen with owners of Android and Apple store owners? Assuming something like this does happen (assuming! 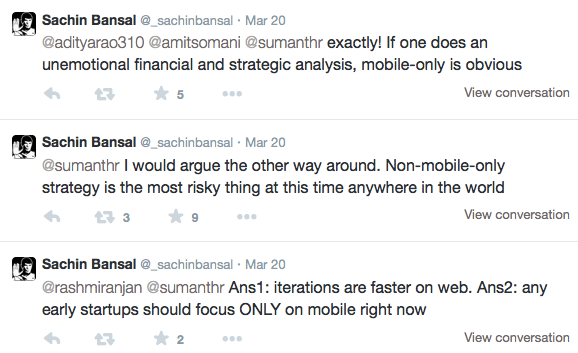 ), what will happen to the e-commerce players’ 100% focus on mobile app only strategy? Author bio: Karthik Srinivasan is a communications specialist who moonlights at http://www.beastoftraal.com and has a day-job as national lead, Social@Ogilvy India. He is on Twitter at @beastoftraal, and here on LinkedIn. Times Internet invests in Uber; Private Treaties? As far as search data is concerned, both Google and Bing offer app deep linking to provide a link to the particular product page in the app, rather than just opening the app. So that should not cause a major problem. And payment in ECom websites are not using the platform framework for in-app payment. They use a separate bank-gateway (using a browser component) mechanism which the platform absolutely cannot interfere. So platforms charging more for transactions is out of question. maybe because e-commerce in india is not that mature and still need a long time development. In contrast, cases in china is much better. could know the example from dhgate.com or other well known e-commerce sites. Oh! So that's the reason. They have disabled the mobile website altogether! I had Snapdeal and Flipkart applications removed from my phone almost six months ago because of them bugging me with "offers" via notifications several times a day. I used to skip the installation while searching and browse the mobile website instead but now I guess I will pass on them. Hey Amazon! According to common wisdom, if a company supports more options, it should be able to address a wider market, generate greater revenues, earn more profits and enjoy higher valuation. However, UBER is a classic case that defies this common wisdom. The company commands skyhigh valuation and is the poster child for "sharing economy" despite "forcing people to shop only one way" - no telephone booking, no cash payment, no advance booking. Between Meru, Ola, TFS, and the like, I must have taken 100+ cab rides so far just in India and not one of them has been on UBER. Maybe Myntra, Flipkart and the others moving to mobile app only regime know something that UBER knows and the man on the street - including me - doesn't.